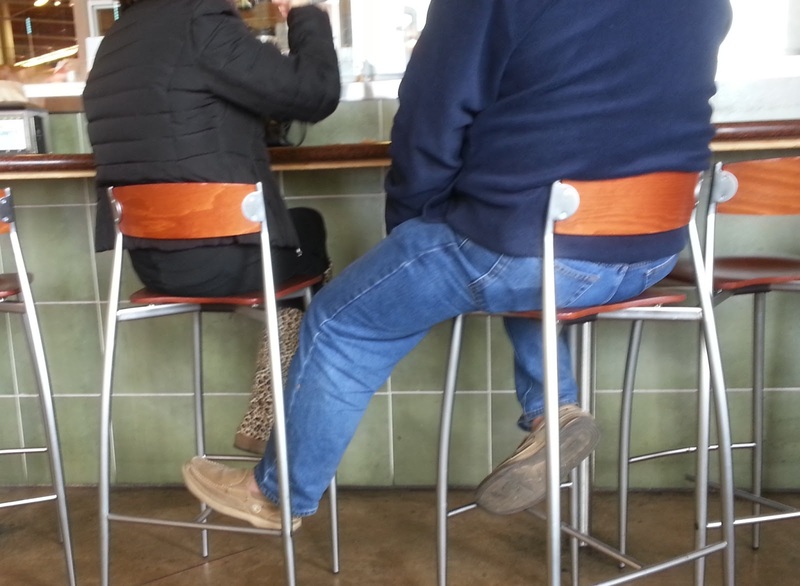 The above image displays a very common body language behavior - the act of putting one's foot on another person's chair. Words that are written and spoken in any language can have completely different meanings depending on the other words which accompany them - even if they're spelled the same and pronounced the same (e.g. hot, dressing, fly, love, kill, etc.). Body language is no different. These "nonverbal homonyms" have to be interpreted in the context of the other "nonverbal words" present in the "body language sentence". In the context of romance and dating this "foot on another person's chair" sends a strong signal of affection and/or sexual interest. It is a "touching surrogate" which can pre-date hand holding, affectionate touching and holding hands. Of course it may also be displayed once these relationship milestones have already been reached. It is also commonly observed as among family members as a symbol of affection. Once again it's a touching surrogate commonly seen in public rather than more overt public displays of affection. Thus also signals an ownership-stewardship characteristic between parents as well as between siblings. If this is observed in a business setting, it could of course signal potential romantic attraction. However much more often in a work-place context this foot-on-another's chair is an alpha personality display. If the foot encroaching into your personal space belongs to your boss an occasional dominance display is within normal behavior. Too much though can signal a problem. This foot nonverbal can also be an indicator of an autistic spectrum disorder - which of course are accompanied by other signs. Intriguingly, those with ASD may invade others' space and not be aware of it - and yet they may become very upset when their own space is violated. But lookout - for when this foot-to-chair body language is seen often & in the absence of autistic spectrum disorder - it is a strong indicator of narcissistic personality disorder. Multiple personal space violations always have meanings - some benign, some romantic and still others should send up red flags. Notice in the image above, the man is turned toward his partner/date with a more-than-moderate seated crotch display (which in the context of dating/flirting/relationships - also has strong sexual signals). She is not reciprocating. With this lack of positive feedback in a dating scenario, the gentleman should remove his foot and while still turned towards the lady - perhaps sit with a less overt crotch display. Unfortunately, many men are oblivious to this and similar behaviors. Are you or your partner nonverbally tone deaf?